Greg Stone, founder of Stone Communications, is a highly sought after media strategist whose clients have included Fidelity, IBM, 3M, and Harvard University. He is author of Artful Business: 50 Lessons from Creative Geniuses. Stone, Greg. 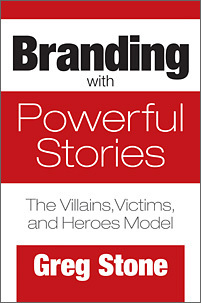 Branding with Powerful Stories: The Villains, Victims, and Heroes Model. Praeger, 2018. ABC-CLIO, publisher.abc-clio.com/9781440864780. Whether you are branding your company, your product, your service, or yourself, learn to boost the power of your story and convey a compelling message in any setting by incorporating villains, victims, and heroes.